At N.Y. Cake we carry only the very finest baking supplies for our customers. Our inventory of sugar pearls is sure to be some of the highest quality you have ordered. We take pride in sourcing only fresh and wholesome accents for adorning your baked goods. Whether you are decorating brownies, cupcakes, or cakes, you will enjoy the unsurpassed quality and presentation you can achieve using quality sugar pearl accents. We have sugar pearls in a wide variety of different sizes to suit your needs. They can be easily attached with the help of frosting or piping gel. Each package of sugar pearls comes Kosher certified and they are available in 4 ounce, 1 pound, 2 pound, and 11 pound sizes. 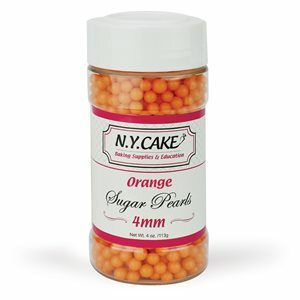 Contact N.Y. Cake for more information about our sugar pearls or to place an order. Give us a call at 1(800) 942-2539 or fill out our contact form today. We look forward to providing the high quality baking supplies you can rely on for all of your baking needs.